My tryst with IBM started 10 years ago, when I was a young mother. Overwhelmed with my newfound responsibility and a little apprehensive about joining a new organization, I would not call it an easy decision. But I made a well thought-out career move, surged ahead, and started my journey as a brand sales specialist. Since then, I haven’t stopped or looked back. I have done multiple roles in this tenure, roles that have challenged me and made me come out of my comfort zone. As Bethany Hamilton said, “Courage doesn’t mean you don’t get afraid. Courage means you don’t let the fear stop you.” Throughout my career, I have taken risks, challenged the status quo and embraced change. I always knew what I was getting into. I had a team who trusted me with responsibilities larger than myself at the time. My roles have given me a holistic product/software knowledge as well as an industry-centric view. In my current role, I moved to do the strategy role to form a broader picture of the organization. Working with Andreas Hartl, General Manager for IBM Cloud in the Asia Pacific, has taught me how people are our most valuable assets and why we should invest more in them. One of the experiences at IBM which helped me evolve both as a professional and individual was the Corporate Service Corps (CSC), IBM’s leadership development and social engagement program. My CSC assignment in South Africa taught me to look beyond myself and contribute to a larger cause. It won’t be justice to my story if I don’t mention my mentor, Vanitha Narayanan, the Managing Director of IBM India at that time, who has taught me so much and made me believe in myself. An incident that made me a firm believer of never giving up, is one Quarter-end deal story. Quarter-end is a critical time for IBM Sellers, and there were only two days left to quarter close. My day had started really well but suddenly, close to the afternoon, I received the news from the client’s office that the deal will not close in the quarter and nothing could have been done about it. Lost and dejected, I called up my mentor and informed her about it as it was already committed. She then asked me if there is absolutely nothing that can be done about it. I pondered and thought if only our Global CEO calls up the client we may be able to save the deal. It sounded unreal but my mentor believed in me and acted on it. Last I know, the deal was signed on the last day of the quarter at 8:30 PM. This experience taught me that when you feel that there is no way out, just step back, pause, and think. Likely, there is a way around the challenge. My advice to the talent of today is to be self-motivated and high on energy. Build a strong support system around you, that will help you enjoy and love every bit of your career. The ecosystem around you will help you realize your true potential and deliver your best. It is important to savor every experience of life – both the good and the bad experiences influence us in ways we may not even realize at the time. If there’s something new and something you have not tried before, put your hands up and volunteer! 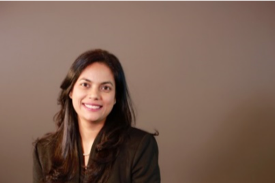 Neha Varshney Arora is the Strategy Leader for Cloud across Asia Pacific. Neha supports and drive various strategic projects at APAC for Andreas Hartl – General Manager – IBM Cloud, Asia Pacific and work closely with AP Cloud Leadership team to further the growth imperatives. Neha has held several key roles in IBM including managing large financial enterprise clients in India and handling global banking accounts in Singapore. Neha was with IBM India in Sales and Distribution looking after financial services business where she grew IBM revenue substantially over a 3 year period. To keep up to date with IBM career opportunities, join the IBM Talent Network !